Storyline: Camilla Cream is a school age girl that loves lima beans and wants to please everybody. But she cannot admit to other kids that she likes the beans because nobody like them and she is afraid they might laugh at her. Also she cannot decide what to wear to school because she cannot find an outfit that may please everybody. And so, one morning she suddenly breaks out in rainbow stripes. Her mother order her to bed. But things just get worse. As the doctor can’t find anything contagious, she is allowed to go to school. The kids on her class discover that they can order her to break in stars, polka dots or checkboards and they have a great fun doing this. Now, her family keeps her home and more specialists come to see her; so the news channels from all over. And as everyone think they have a solution, so Camilla changes according with their treatment. Progressively she becomes an oversized pill, then she grows a tail, branches and flowers, and even roots, and eventually melts into her room’s walls (scary), her mouth being the bed and her eyes, the two paintings on the wall. The parents are crushed. Still looking for answers, they let in a sweet old lady carrying a tote with lima beans. She offers Camilla some of the beans telling her that they may cure her but Camilla is just afraid that people may laugh of her if she eats them. 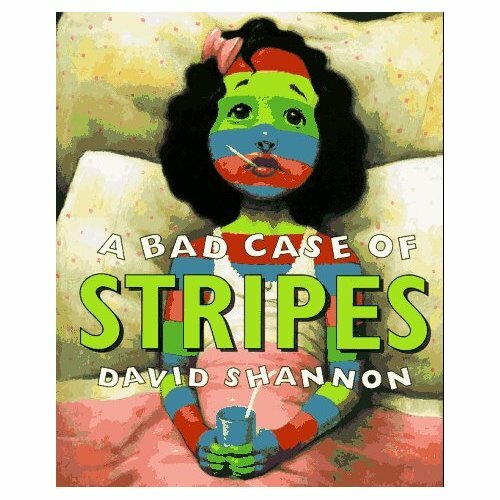 But then realizes that she would happily eat lima beans all the time then to have to endure stripes and all that. So, she eats them. And as like magic, she is herself again. The end…. The last page shows Camilla Cream eating a huge plate of lima beans. Ata girl. Characters: Camilla Cream, Dr. Bumble, Mrs. Cream, Mr. Cream. Illustration: David Shannon is also the illustrator of this book. He has a very distinct style of illustration. His depictions have a certain solidity, even bulkiness. This particular book is illustrated with great attention to details and in a more realistic style. A great deal of the illustration is payed to the colors, as the transformation of little Camilla need to be very well presented. So he makes colors bright and catchy. There is nothing out of place on this books illustration. It is just wonderful. This and the fact that the storyline has a point makes it a very good book.